I've often heard that experience is the best teacher. And in my 52+ years of living, I've learned that lessons can come from some unexpected sources. This week I've had both of those points driven home to me as I learned a life lesson from--of all things--a washing machine. Several years ago I succumbed to the allure of an impressive new washing machine. I got rid of my boring old mechanical washer and invested in an expensive, electronic, high-efficiency model. I was slow to join the party of high-efficiency washers. I waited until lots of the bugs had been worked out. 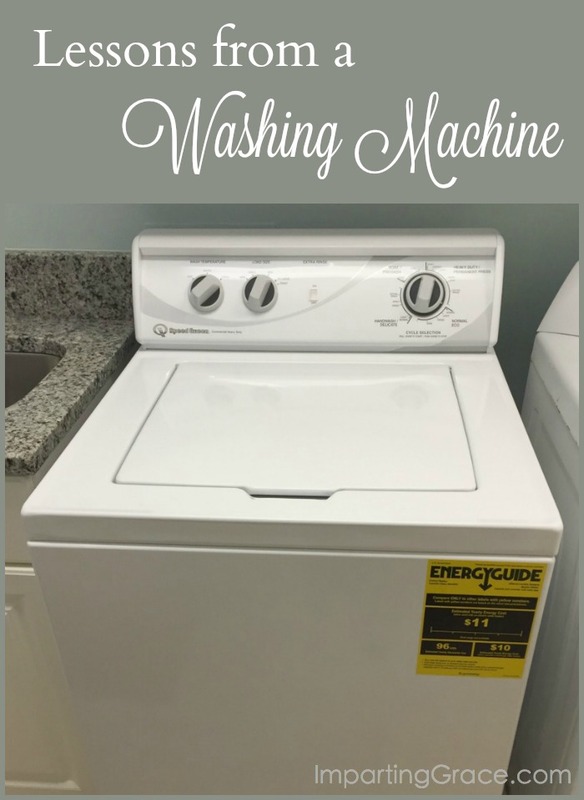 I listened to the experience of others who struggled with things like mold and mildew and bad smells emanating from new washers. I did my research. I bought wisely, taking advantage of sales and special promotions. I finally ended up with an all-singing, all-dancing washer--one that would take all the guesswork out of laundry! One that would turn a dreaded chore almost into a pleasure! One that would reduce a job that used to take much time and used a lot of energy into a job that would be done efficiently, with minimum effort and little expense! Except it didn't quite work out that way. The first thing I noticed was that my white clothes weren't getting white any more. Unexplained gray spots began appearing on formerly pristine whites. I did some research and learned that I was using way too much detergent. My new machine was designed to use a tiny amount of laundry detergent. Aha! Problem solved! But even when I used a minuscule amount of detergent specifically formulated for my type of machine, I still had grayish clothes. It was a bother, but not enough to make me take action. Then I noticed that my clothes didn't seem to be rinsed well. Often dark clothes would have soap smudges on them when I removed them from the washer. So I began running most loads through an extra rinse cycle. No problem, right? It was only an extra 24 minutes for every load. And then I noticed that, even with the extra rinse cycle, my clothes came out of the washer smelling strongly of whatever substance I used in the washer. If I used scented detergent, the clothes smelled like detergent. If I used bleach, the clothes smelled to high heaven of bleach. And if I used vinegar, the clothes smelled just like the bottle of vinegar. The big tip-off, though, came one day when I was removing clothes from the washer and realized that some of the items were not wet at all. Not even damp. Eventually it became clear to me that even with reducing the amount of detergent I used and running extra rinse cycles, my impressive electronic washer just wasn't using enough water to get my clothes clean. Unfortunately, because my washer was a super-fancy electronic model, there was no way to simply lift the lid and add extra water. After talking with a number a people about my problem, I finally decided that I could outsmart my washer by selecting the "Bulky Items/Comforters" option on my control panel. I could thereby fool my washer into thinking that some extra water was needed. It took a long time, but finally I realized how ridiculous it was for me to be trying to outsmart a household appliance. So as of this week, I am once again the proud owner of an old-fashioned mechanical washing machine. It doesn't sing. It doesn't dance. It doesn't weigh my clothes and determine what needs to be done to them. Instead, it sits there and waits for me, the human being in charge, to set the dial for the water level I need. Now cue the angels singing: after years of struggling with a machine, my clothes are finally clean. Maybe I'm getting too philosophical about an appliance, but with my new washer I've learned a valuable lesson. What I wanted was not to have to think about the laundry. I wanted the job to effortless. But jobs like laundry aren't effortless. They take time and energy to be done well. To get the best results, a human being needs to exert some effort, make decisions, judge what is needed and choose the best way to proceed. But the result is worth the effort. Life is a lot like laundry, I think. We want it to be effortless, or at least require much less effort. We're easily seduced by promises to make life easier. I wonder if our lives have been greatly enhanced by so many gadgets that we lose sight of the need for and the value of human effort. Quick! Easy! Those are the labels that catch our eyes; those are the promises that turn our heads. But slow and hard is the work of building character. Slow and hard is the work of living with integrity. Slow and hard is the work of investing in relationships. But once again, the result is worth the effort. What do you think? Do you learn life lessons from unexpected sources? I am so jealous. My hubby wants me to hang on with since it cost so much. I too fell victim to that little trend, and it has taught me a lesson as well!!! I have learned a few tricks of the trade such as adding borax and Tide Oxi Clean, but so much for saving money because I am using two detergents for every cycle. I wished had wisely all those years ago. Yes. . .life does have a way of teaching us some valuable lessons, indeed!!! From one barely wet front loader owner to you... I understand! New fangled is not always better. I have the old mechanical kind too and I absolutely love it. It gets everything spotless and the dryer even does an amazing job to reduce wrinkles, so little to no ironing. I can't think of getting rid of them. Our son worked for a major appliance call center while in college. He advised me to never purchase a front loader. He spent many hours on the phone with customers regarding issues with their fron loading washers. I think that might be the first time my son ever "saved" us money. I've learned from your experience too, Richella. I'm glad you shared it. You brought it to a good applicable conclusion, too. Well done dearie! Thanks for the laugh this morning, Richella! I have wanted an HE washer for years but you are making be think twice. We still have the old, what my friend calls a "beater" washer. But it works! You are right- so often we want quick and easy but most things that come this way aren't worth having. Loved this. I have resisted the urge to go new and improved too and am so glad. Sometimes the "old ways" really are the best. At least we are not out in the back yard with a laundry tub LOL !!!! Thanks for teaching us lessons in our everyday walk. I love how God can use the simplest things to teach us a lesson. Thanks for sharing your lesson with us! I loved this post!cthe last two things I've learned lessons from were a baby bottle and a hornet's' nest. Go figure! Tried and true is usually best. I too learned a lesson the hard way. We went in a few years back to buy just a basic mechanical washer and basic dryer. You know, both for less than 1K. Well, the allure of the fancy digital, whisper quiet machines took over and the next thing I knew, I'd spent almost double my budget. I have noticed that my whites don't seem to get as clean, and they seem to wear out much quicker - my towels seem to become frayed easily. We had to have the board on the washer replaced due to issues that were not properly disclosed to buyers. The dryer sometimes runs forever and if I don't remember a load it may dry for two hours. I can't wait until I can justify going back to a simple, basic set. And yes, we can learn life lessons from appliances. Loved this post.